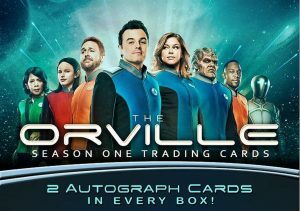 2019 Rittenhouse The Orville Season 1 - Entertainment Card Checklist	Overall rating:	3	out of 5 based on 1	reviews. 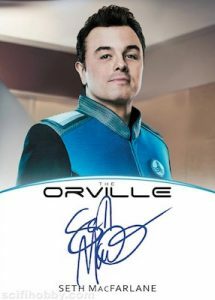 2019 Rittenhouse The Orville Season 1 is an entertainment card release that is dedicated to the comedic sci-fi release created by Seth MacFarlane. The series is a parody of Star Trek and offers 2 autographs per box, as well as some inserts and a possible memorabilia hit. As is the case with all Rittenhouse releases, there are certain cards that are exclusive to certain promotions, as well as some incentive autographs that are given with case purchases.